A five-minute segment of an episode of Adult Swim containing a brand new Aphex Twin track from the Collapse EP due to air last night was cancelled after failing the Harding test for photosensitive epilepsy. It was revealed yesterday that the segment, named after Aphex Twin's upcoming EP Collapse and expected to feature new music from the producer, would air on the show but the network has since confirmed to Pitchfork that this is no longer the case. On Twitter, Adult Swim’s Creative Director of On-Air Jason DeMarco additionally revealed the reason for the cancellation. "Didn’t pass the Harding test, so we will be premiering it online," he wrote in response to an inquiry regarding the premiere. The Harding test, which is obligatory for television broadcasters, requires that images and videos aired do not risk triggering photosensitive epilepsy. Collapse is Aphex Twin's first official release since 2017's limited EP which was sold at Field Day. He also last year shared a streaming platform featuring much of his back catalogue and unheard tracks. 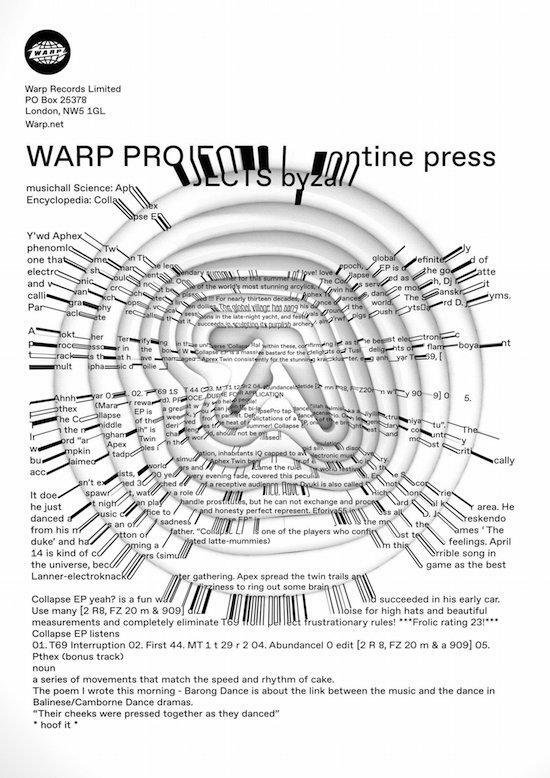 The new EP has been teased in recent weeks via a series of adverts baring the famous Aphex Twin logo which were spotted in London and Turin.